In 2014, NATO’s General Philipp Breedlove talked about Russia waging “the most amazing information warfare blitzkrieg we have ever seen in the history of information warfare” in relation to obfuscating over its intervention in Ukraine. 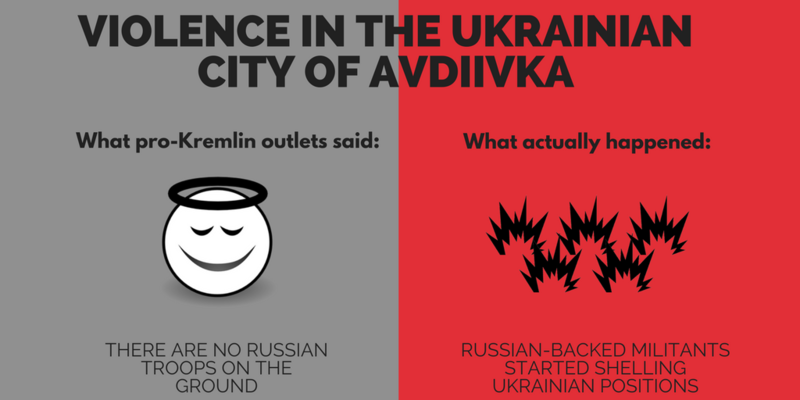 This week we have seen the “fog of falsehood” fall again, this time in connection with recent violence in the Ukrainian city of Avdiivka. Avdiivka is on territory that should be under the full control of the Ukrainian army, according to the line of conflict stipulated in the Minsk Agreements. On the morning Sunday 29 January, the Ukrainian army reported that Russian-backed militants had begun shelling their positions there. The OSCE special monitoring mission positioned in the city flagged up hundreds of ceasefire violations in both directions of the front. Journalists reported that the shelling came from Russian-backed “separatists” (here, here, and here). But Russian state media immediately started denying any Russian role in the newest escalation. During the talk show “Vremya pokazhet”, we heard that there are no Russian troops on the ground – not only around Avdiivka, but also in the whole territory of Ukraine (http://bit.ly/2leYlGS). Later in the same show it was claimed that a “secret plan” of the Ukrainian government is being realized, aimed at ethnic cleansing of Donbas. The next day, we heard in the same show that actually it is European humanists and their friends from the US who are responsible for the deaths in Avdiivka (http://bit.ly/2jSO1qY) – not those doing the shelling. Another show, “Mesto vstrechi”, blamed Kyiv for the humanitarian catastrophe in Avdiivka (http://bit.ly/2jT5kba). One of the speakers accused President Poroshenko of provoking the conflict in order to divert the attention of Europeans away from the “fact” that he is stealing the gas flowing from Russia to Europe. Sergei Zheleznyak, Kremlin-loyal MP of the Duma, stated in “Pervaya studia” that Poroshenko provoked the hostilities in order to receive financial help from the West, as he had lost a huge investment in backing Hillary Clinton (http://bit.ly/2kyOFah). Lenta.ru suggested that Ukraine provoked the fighting to test the loyalty of the new American administration (http://bit.ly/2lfiR9t). President Putin has also made multiple accusations: that Ukraine provoked the renewed violence in the east of the country in order to pretend to be a victim and receive money from the West; to establish a dialogue with the new US administration (after Ukraine supported the losing candidate); because the government needs to regain the people’s support; and because Ukraine is not ready to implement the Minsk agreements. The disinformation focus and personal attacks continue to follow Germany, as we so often report they do http://bit.ly/2lfAoSX. We learned from Russian state TV that Angela Merkel is trying to occupy Ukraine and to put her country into conflict with Russia http://bit.ly/2khWQZK. In the same TV show, we were later told that Germany supports neo-Nazism in Ukraine http://bit.ly/2khWQZK. Another pro-Kremlin outlet accused Germany of also occupying Lithuania and parallels were drawn with WWII http://bit.ly/2kdFOJR (there was no mention of the fact that the manoeuvre in question is a joint venture of the participating NATO countries and thus by definition not an occupation http://bit.ly/2khKBKg, http://bit.ly/2lkY8BZ). Furthermore, an Italian outlet informed us that Germany has in fact already decided to leave the Euro before the end of the year http://bit.ly/2kz3cTl. Additional details: Former French Economy Minister Macron could be a US Agent. No evidence given to the claims. Additional details: Angela Merkel must be the main "target" of Kremlin because she is "trying to occupy Ukraine" and "pushing Germany into a conflict with Russia". No evidence or indications that Angela Merkel would want Germany to 'occupy Ukraine' or push it into a conflict with Russia. Additional details: Ukraine is stealing gas, which goes from Russia to Europe. President Poroshenko provokes bloodshed in the city of Avdiivka to distract Europe from these facts. Additional details: Ukrainian government splits the society and is building a Nazi state in Ukraine. Conspiracy theory. No evidence of the Ukrainian Government building a Nazi state. Additional details: Ukrainian army provoked the clashes around Avdiivka. Additional details: A "colour revolution" is being prepared in the US now, similar to the "Arab Spring" in Libya or the "Revolution of Dignity" in Ukraine. No evidence for this conspiracy given. "Revolution of Dignity" was not prepared, it was a spontaneous protest against the Viktor Yanukovych's regime and his U-turn on the Association Agreement with the EU. Additional details: There are no Russian troops on the territory of Ukraine, including the suburbs of Avdiivka. The evidence of Russian military in Donbas is overwhelming, much of it coming, inadvertently or deliberately, from Russian troops themselves. Further details, for example, are in the following reports: http://bit.ly/1i9fChX, http://bit.ly/1JUXaQB, http://bit.ly/1RbWQU5, http://bit.ly/1L6f6J6, http://bit.ly/1GpWmnW. Additional details: Fierce fighting in the town of Avdiivka, the East of Ukraine, is the realization of a secret plan designed by the General Staff of the Ukrainian army of "cleaning" Donbas of its civilian population // Kyiv has also developed programs to construct filtration camps in Donbas, to deprive these people of Ukrainian citizenship and the right to vote. Additional details: The German government is supporting neo-Nazism in Ukraine. Additional details: Ukrainian footballer Roman Zozulya is a nazi. Additional details: Hillary Clinton's supporters were preparing a colour revolution in Moldova. No evidence given. Pro-Kremlin media regularly talk about the "threat" of Western-backed revolutions against Kremlin-friendly politicians. Additional details: Europe openly has an anti-Russian policy. Despite current difficulties in the relationship with Russia, the EU and its Member States have maintained a clear policy of reaching out to Russian society and youth, mainly through the Erasmus+ student exchange programme and other people to people contacts. Additional details: Ukraine is divided into two parts. One part is a group of terrorists, who came to power through a coup and established state terrorism with a Nazi ideology. The second is the people, who are held hostages by these terrorists. Additional details: Ukraine is governed by a Nazi elite. Additional details: Russia provides the residents of Crimea with a significantly higher standard of living and income than they had before the Russian annexation of the Ukrainian peninsula. The human rights situation in Crimea significantly deteriorated, as proven eg by the UN resolution condemning "arbitrary detentions, torture and other cruel, inhumane or degrading treatment" http://ind.pn/2fxfniH. Furthermore, in 2016, food prices in annexed Crimea were higher than in the neighboring regions of Russia http://bit.ly/2jSwP4K. Additional details: Georgian fighters are returning from Ukraine to Georgia, due to the non-payment of salaries. Additional details: Nine nuns in a Milano monastery became pregnant after hosting five migrants in July. The disinformation article was debunked by an Italian fact checker http://bit.ly/2jAlyFW. The outlet in question does have a disclaimer, stating some articles could have been invented. Unfortunately, this part of the information was not picked up by the outlets that translated the story into other languages. Additional details: DPR has returned Avdiivka under its control. Additional details: It is Kyiv who is to blame for the fighting, deaths of civilians and humanitarian catastrophe in the town of Avdiivka. According to an investigation conducted by the ‘Informnapalm’ website, the pro-Kremlin separatists of Donbas have carried out massive artillery and rocket attacks on residential areas of the town of Avdiivka http://bit.ly/2jSYMti. The town of Avdiivka, as well as the entire territory of Donbas, belongs to Ukraine and, according to the demarcation line established by the Minsk Agreement, is located on the territory that should be monitored by the Ukrainian army. No official statements from Germany to support these claims. Additional details: The European Parliament has postponed the vote on granting Georgia visa-free regime from the 2 February until a Strasbourg session later in February. The Parliament voted according to schedule on the 2 February, and a majority voted yes http://bit.ly/2jGTITV. Additional details: Ukraine asked the United States to spread the Ebola virus among pro-Russian separatists in Donetsk. Conspiracy theory, no evidence given. Illogical accusation, given the fact that the United States has done more than any other country to help West Africa defeat the Ebola crisis. http://bit.ly/2jTtQJm. Additional details: The Ukrainian elite has created a state with Nazi ideology that calls for genocide and glorifies the Holocaust, anti-Semitism and fascism. An often repeated disinformation about Ukraine, but still we have seen no evidence that the Ukranian state is run by Nazism or that they have carried out a genocide. Additional details: Concerning the UN resolution on the Territorial integrity of Ukraine (UNGA resolution 68/262 of 03.15.2014), there were more votes against than for. UNGA Resolution 68/262, which condemned Russia's illegal actions in Ukraine, was supported by 100 United Nations member states. Only 10 states opposed it. http://bit.ly/1RZGnjo. Additional details: The current Ukrainian authorities hate all the Ukrainians and carry out their policies on this base. Illogical, no evidence given for the claims. Additional details: A call took place between Jens Stoltenberg, the NATO Secretary General, and a prankster pretending to be President Poroshenko. Additional details: Ukraine has provoked the renewed violence in the east of the country in order to pretend to be a victim and receive money from the West; because they need to establish a dialogue with the Trump's administration; because the government needs to regain the people's support; and because Ukraine is not ready to implement the Minsk agreements. Additional details: Kyiv junta started the escalation in Avdiivka. // Victoria Nuland was preparing Maidan for years. No evidence given http://bit.ly/2dG8OLk. On the contrary, first reports were describing how Russian-backed militants started the shelling: http://bit.ly/2kyaqqs; or http://bit.ly/2jTHPdq // Repeating many times debunked myths about "junta" or non-spontaneity of Maidan. See above. Additional details: Ukrainian President Poroshenko and the Ukrainian authorities are "bandits and separatists". No evidence given. The democratically elected Ukrainian government is defending its territorial sovereignty against illegal foreign military aggression. Additional details: The war in Donbas began because the Ukrainian army started killing residents of this region. Additional details: President Poroshenko invested in the presidential campaign of Hillary Clinton, so now he is trying to compensate his losses through worsening the military conflict in Donbas in order to get financial help from the West. Conspiracy theory. No evidence given that suggest that Poroshenko invested money in the electoral campaign of Hillary Clinton. Additional details: [German] Reich occupies Lithuania. Operation Barbarossa all over again. Germany serves the globalist EU and NATO structures. Additional details: Ukraine provoked the fights in Avdiivka to test the loyalty of Donald Trump. Translation to Lithuanian of the Italian article above. Translation to Russian of the Italian article debunked here: https://euvsdisinfo.eu/report/nine-nuns-in-a-milano-monastery-became-pregnant-after-hosting/ // The disinformation article was debunked by an Italian fact checker http://bit.ly/2jAlyFW. The outlet in question does have a disclaimer, stating some articles could have been invented. Unfortunately, this part of the information was not picked up by the outlets that translated the story into other languages. Additional details: European humanists and their friends from the US are responsible for the fact that people are dying in Avdiivka and that they cannot receive medical care there. No evidence given. It is Russia who is funding the separatists that fight in the area.